Right-click on dashboard sheet, select “New Sheet Object,” click on the “Extensions” tab, then drag “QlikMaps for Polygons / Lines” on to the dashboard sheet. Note: If using QlikView Desktop Client, you must be in “Web View”. Behind the scenes, QlikView resolves the Dimensions and Expressions for QlikMaps exactly as it would for any out-of-the-box sheet Chart Object, such as a Straight Table. It is often helpful to first build a Straight Table object before building a QlikMaps object in order to work out any data issues and problems with formulae that are unrelated to QlikMaps. The typical Properties window in QlikMaps for Polygons. Select a field in your data model that is the unique identified for each polygon or territory you want to plot. This is the value that will be used as a selector when lassoing polygons from the map. New in QlikMaps 2.2.1, you can use HEX format, ARGB format, or the QlikView native COLORMIX function to control color and opacity (you can also control opacity by using the Opacity expression). See Create a Heat Map of Polygons for additional examples. This is where you specify the popup text that appears when a user clicks on a polygon. This expression must return a text value. The expression can return a simple text value, or it can return a value that is in HTML format, or return a null value of "-" to suppress popups on a per-row basis. If this expression returns an integer value between 0 and 100, the value is used to set opacity. 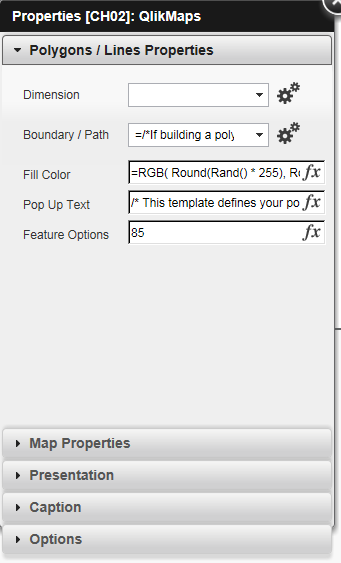 Additional functionality was added in QlikMaps 2.3 to to change the color, weight and format of the polygon border. See How do I customize polygon borders? Sticky Popups has been moved to Sticky Popups under Map Properties.